Readers may think I have always had French SYW forces. Almost true. My first units were Saxons. In the past few years I've been in a slow rebuilding program perhaps distantly similar to the actual rebuilding of the army after it capitulated to Frederick in 1756 at Pirna. You've seen the Rutowski Chevauleger and von Brühl Dragoon Regiments appear in the past three years here. May I now introduce you to the reformed Leib Squadron of the Leibküassiers? Double click images please. Otto Max Grosse's 1907 inaugural dissertation entitled, Prinz Xaver von Sachsen und das sächsische Korps bei der französischen Armee 1758-1763 has been in my library since 1968ish. An amazing ninety-one page publication which ought to be translated and made available for our hobby use. After Pirna, Prinz Karl, von Brühl's and Prinz Albrecht plus three regiments (pulks) of Polish lancers were all that remained of the Saxon Cavalry Corps. Grosse tells us on pages 46-48 that a kürassier regiment of four squadrons was reformed in 1761. David Morfitt in the UK generously assisted me about the mysteries and enigmatic prose of the Pengel and Hurt pamphlets to unravel a standard for my Leibkürassiers. All errors above are mine - not Davids. Saxon experts will perhaps observe the above Leibkürassier standard is from umm - the Napoleonic Wars. Ach du lieber! I surrendered to convenience and impatience only today. The square border was not there in 1755. Thank you David! The officers are taking a keen interest in you staring at their squadron. Have a care! Back to Grosse. 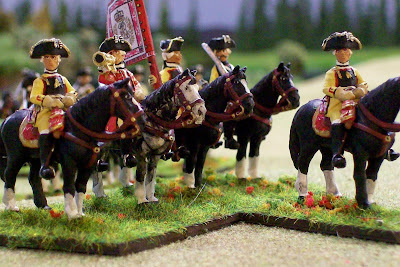 A kürassier regiment of four squadrons was available in May 1761. It consisted of two companies of Garde du Korps and two companies of unnamed kürassiers. Were the former never captured at Pirna? Grosse says on p. 13 that the Garde du Korps was present in 1758.Were the latter other escapees or what? What else made up the regiment? The new regiment had four squadrons each of two Kompagnien. Each company was supposed to have 80 men including officers. 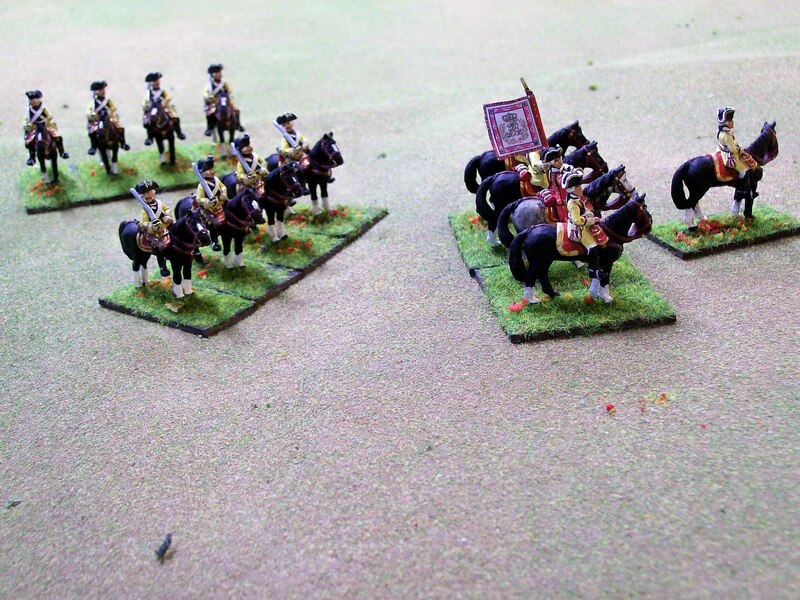 That's 640 cavalrymen without the regimental staff of fourteen more men. It was raised from the Kreisen of Saxony, Bavaria and Salzburg. Things may get serious in a moment. My reformed regiment will have one squadron of Leibkürassiers above, another squadron of Garde du Korps and I don't know what else. I have enough Eurekas to almost have four squadrons of twelve miniatures each. 1. Having a regiment of varied uniforms is appealing. I have no idea if this was the case, but if I was a Garde du Korps reiter, I think I would like to retain my status and original uniform. Creative thinking (guessing at its best). 2. As for the Leibkürassiers, well, I just like the uniform. I previously thought the new regiment was the Leibkürassiers. I guess not. So much for a memory going back over four decades! 3. What will the other two squadrons be? I don't know. 4. Does anyone know the 1761 name of the regiment? My poor translation of page 48 suggests the regiment was named after Prinz Xaver but I am not confident of this. 5. According to the English translation of Richard Knötel's Uniforms of the World, "During the imprisonment of the Saxon Army inthe Seven Years' War, after its surrender at Pirna in 1756, the cuirassiers formed themselves into grenadier companies, in French pay." 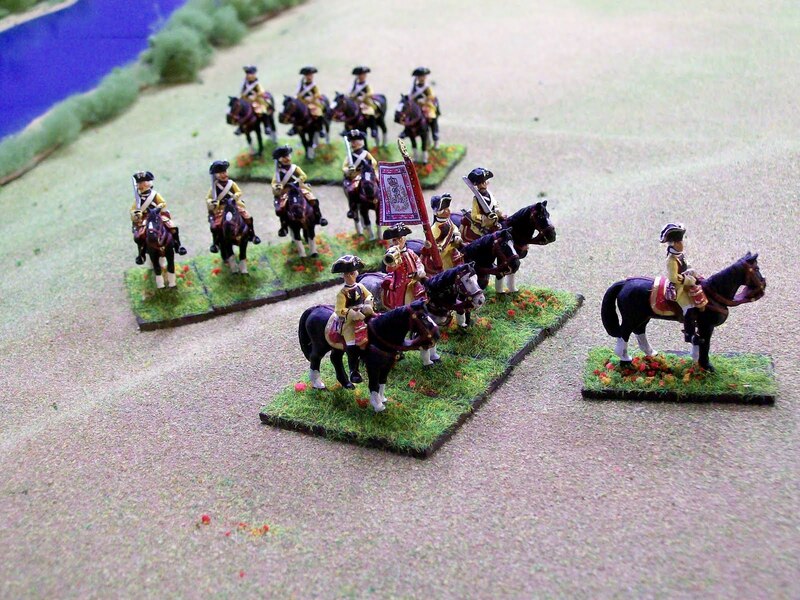 Did they return to the cavalry in 1761? That's what I always thought. 6. 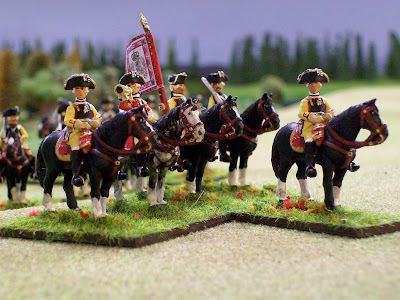 In Christopher Duffy's, Instrument of War, the following Saxon cavalry regiments maintained by Austria were named, Prinz Albert (Albrecht), Bielack, Brühl, Hertzog Carl (Karl), Garde Carabiniers and Schiebel. There is a Knötel uniform plate showing the only squadron of the Saxon von Schill Hussars too. 7. Your remarks are welcome as always below at the word comments.